I’m going back to basics in every aspect of my life. Today, I start with my recipes: simple, easy, and FOUR ingredients. Ya can’t beat that! I’ve been thinking lately that I need to reboot my fit journey, appreciate the littler things in life and not think too big and also, make recipes on my blog that are easy, simple and basic. 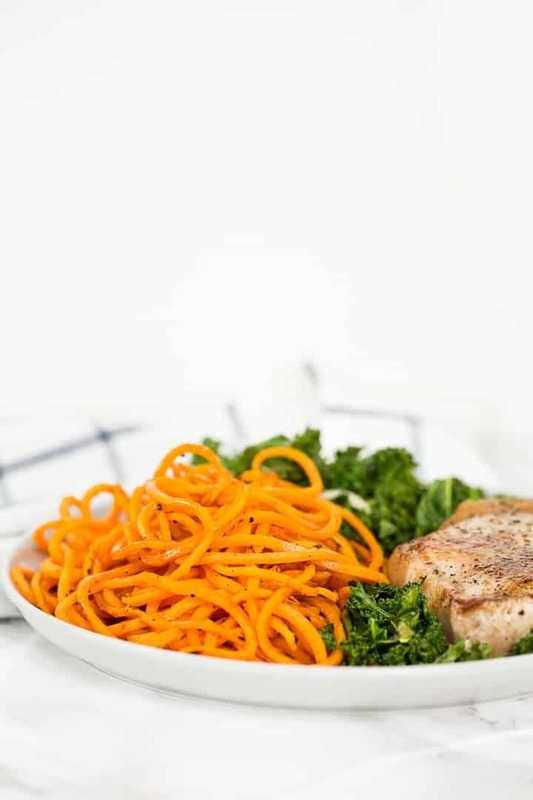 And if you’re thinking, “what about a sauce?”, don’t fret: the pan juices from the pork chops become the “sauce,” and this dish is packed with savory, rich flavor. Let me tell you – this pork chop is juicy, and it barely took me 20 minutes to make it. The trick is not overcooking it, so if you can, grab a quick-read kitchen thermometer, it’ll be your best friend when cooking meats. 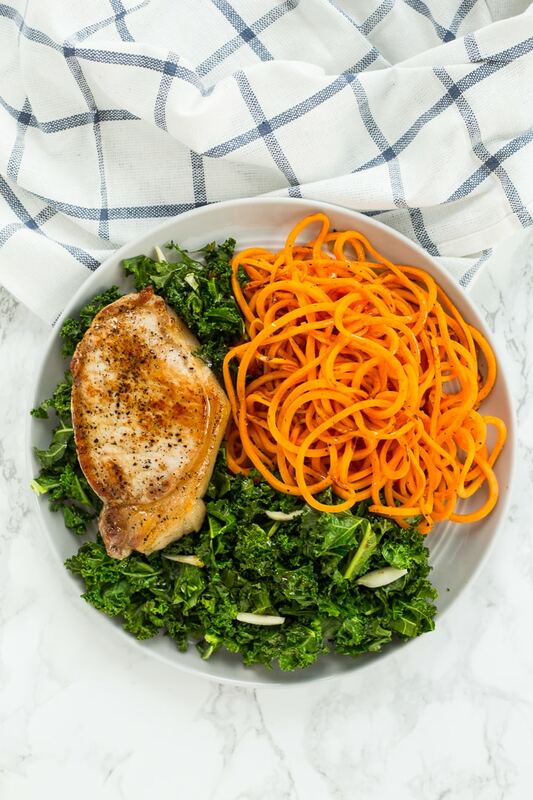 The slight sweetness of the sweet potatoes, the garlicky kale and the juicy pork chop make for a delicious, easy, quick, weeknight dinner. Rub each pork chop with 1 teaspoon of the olive oil, then season with salt and pepper. Set the chops aside. Set a large oven-safe skillet over medium-high heat and add in the last teaspoon of olive oil. Add the pork chops to the skillet for about 3-4 minutes per side until golden brown. Transfer the pork chops to the oven and roast until cooked through, about 7-9 minutes (if using a thermometer, the pork chops should register at 140 degrees in the thickest part.) Transfer the cooked pork chops to a plate and pour any pan juices into a small bowl and reserve. Let the pork chop stand for least 5 minutes, undisturbed. Once you transfer the pork chops into the oven, also place a large skillet over medium-high heat. Add in 1 tablespoon of olive oil and then add in the sweet potato noodles and season with salt and pepper. Let cook for 7 minutes or until cooked to your preference and then divide into two plates and immediately add in the rest of the olive oil and kale into the skillet. Cook the kale for 1 minute and then add in the garlic. Cook the kale and garlic for 3-5 more minutes or until kale is wilted and cooked. 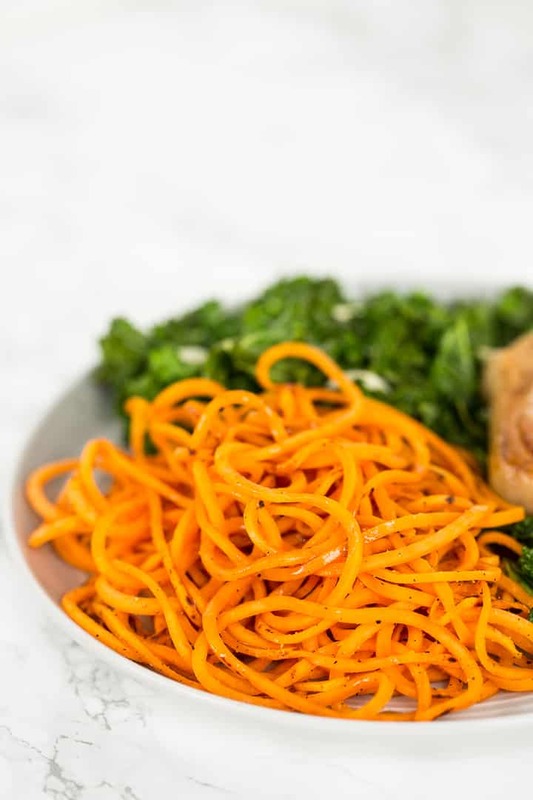 Divide the kale into the plates with the sweet potato noodles. 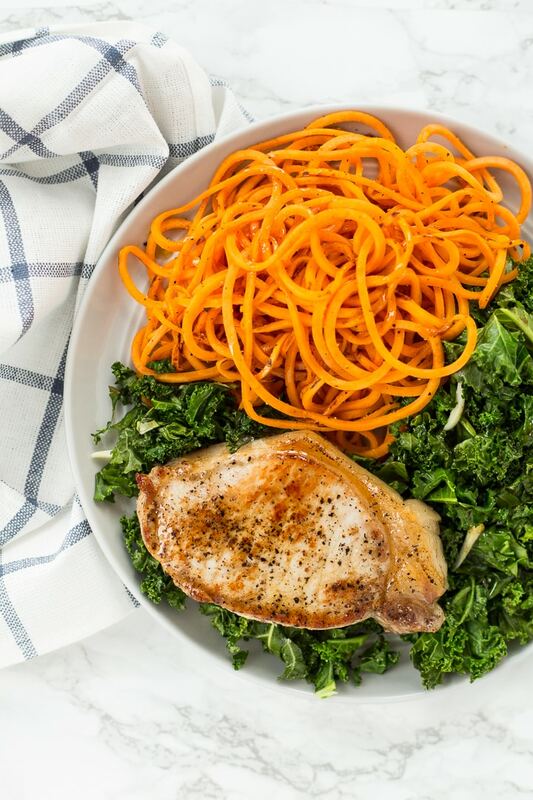 Top each plate with a pork chop and drizzle over the sweet potatoes and kale with the reserved pan juices. Serve immediately. Pork chops are great and so are recipes that are quick and easy, especially after a long day at the office!! Keep the simple & easy coming, have great week Ali. Oh, and the "what I ate today" video series are fun. Thank you Ali for all of your wonderful recipes, videos, posts. Your fit journey is mine, too. Having lost a lot of weight more than once, the challenge has always been finding a lifestyle I could live with easily TO KEEP IT OFF. Your machine, simple and delicious recipes and videos in which you show me how you eat and share portion size have changed my life! Keep it up, with the knowledge that you are doing wonderful things to make peoples' lives better. A personal, heartfelt last atta boy for making it about whole food, not sugar and dessert, like so many other blogs. I so appreciate your appropriate portion sizes on the pork chops! People think that because lean proteins are just that, proteins, they can eat them in unlimited quantities. The way your plate is pictured in this post is exactly right! At least half full of colorful veggies with meat taking a less featured role! Love the simple recipes. Excited to hear more about you rebooting your fit journey. I must be doing something wrong. My first attempt using a sweet potatoe the "noodles" turned out like half circle bits. A far cry from what's pictured. My second attempt didn't turn out much better I still ended up with bits not long noodle like pieces. How are you getting the noodle shape?, or is the photo staged?. It's definitely not staged. I made it last night and it came out as perfect noodles. 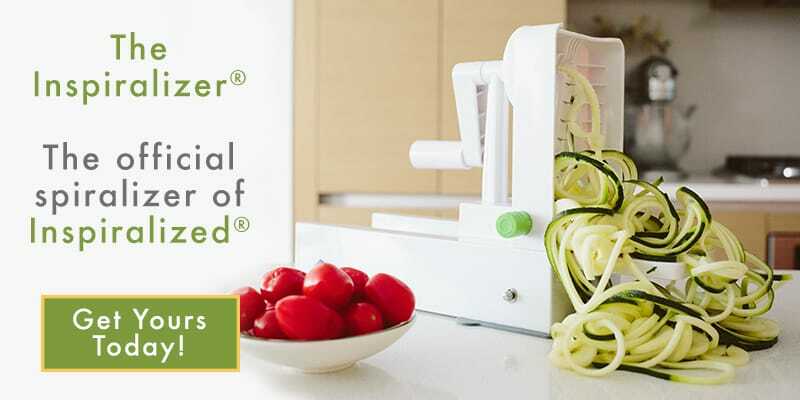 The only thing I can think is maybe you aren't using enough strength/pressure when spiralizing it? It does take more pressure to noodle than something like a zucchini. If you aren't putting enough pressure, it'll keep breaking into little bits. I just made this for dinner last night for the first time. It was absolutely fantastic. It's one of the best meals I've ever made at home. The directions were spot on and I couldn't ask for better flavor. I paired it with some roasted broccoli to add another flavor component. Even my veggie averse kids cleaned their plates. Great, great recipe!! Thank you so much for sharing with us, Stephanie! This is fabulous to hear. We're so glad this recipe was such a success in your home. Excited to try this out this weekend. Thanks for sharring!